Located along the River White Elster in eastern Saxony-Anhalt, the city of Zeitz, with ist population of 29,000 inhabitants, represents one oft he dying cities in the former East Germany. High unemployment, empty buildings, abandoned industries and a crumbling infrastructure, combined with historic buildings dating back to the 1800s that are sitting empty are what a person can see when passing through the city. Most of its main traffic has been diverted away from the city, and the only rail service in Zeitz are the lines connecting the city with Weissenfels, Gera and Leipzig- all privately owned and localized. Yet the city scape of Zeitz has, for the most part been in tact, thus making it the venue for many films produced that require an East German scene or story. Despite their emptiness, many historic buildings in the city center are worth visiting and perhaps occupying with businesses and housing. Even the Moritzburg Castle and the nearby mills and churches, built during the Baroque period, still entertain guests because of their charm. You can also try the local wine from the vineyards located along the rugged Elster Bike Trail. And then, there are the historic bridges. At least a dozen bridges exist along the White Elster within a 10 km radius of the city, six of which can be found directly in Zeitz. Two thirds of them are at least 70 years of age or older. Yet all but two of them have been mentioned in the history books or by the International Structure Database in Berlin (structurae.net) which is part of the Wiley and Sons Publishing Conglomerate. While much of the records have disappeared because of World War II and later the Socialist regime, the structures profiled here are unique in its design and historic value. Most of the bridges are arches, but there are a couple girders and trusses that are worth mentioning as well. Each one lacks the most basic in terms of the date of the builders, their dimensions and for the most part, the stories behind them and their affiliation with the communities and castles they serve. 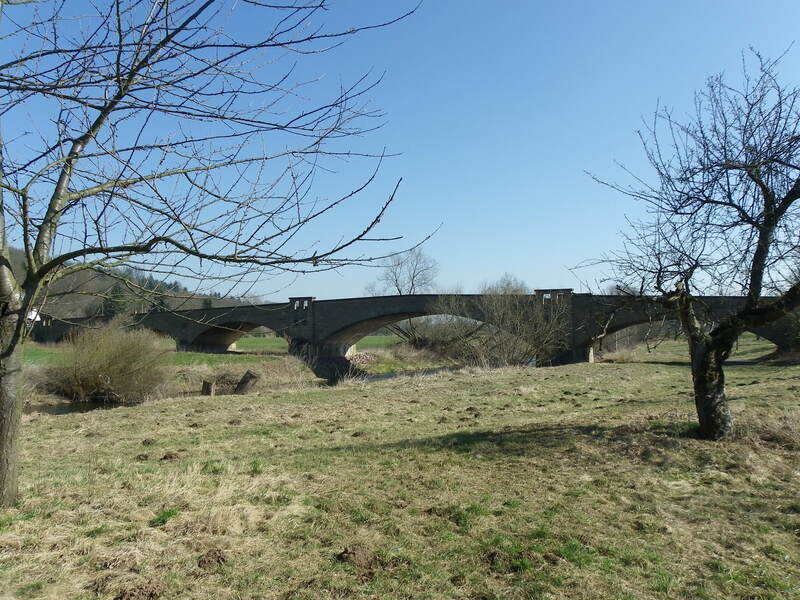 Henceforth, this tour will profile each of the bridges in and around the Zeitz area, starting with the bridges near Crossen to the south and ending at Elsterau to the north. 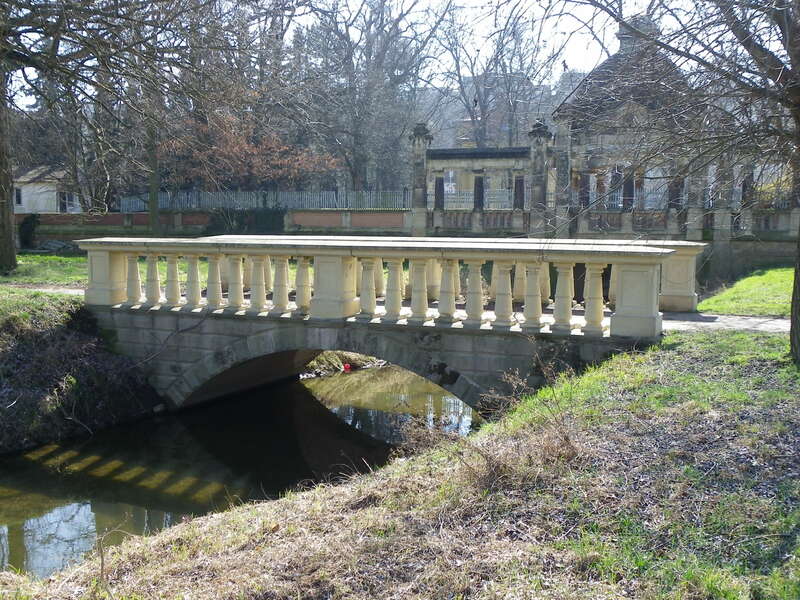 All but three of the bridges profiled in this tour guide are along the Elster. One of the bridges, the Moritzburg Pavillion Bridge, has already been profiled separately in a Mystery Bridge article and will therefore be omitted from this article. A link to this bridge can be found here. This bridge spans Rauda Creek, approximately a half kilometer south of the White Elster crossing. The bridge is approximately 15 meters long and six meters wide, good enough for a bike trail. 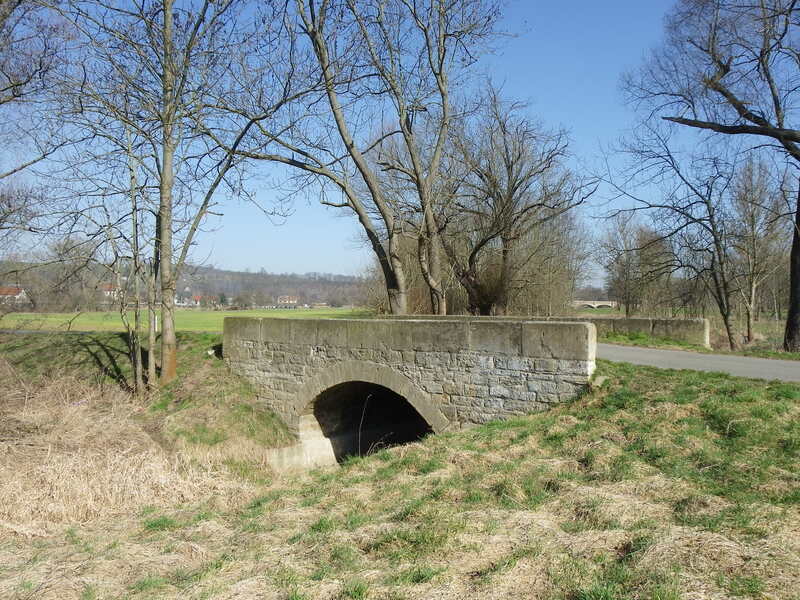 The bridge is a stone arch design that probably dates back to the 1800s, when it was used for horse and buggy, serving a trail between Crossen and Silbitz. Later it was used for farm vehicles, but as the fields nearby are located in the flood plain of the Elste were therefore rendered useless, the trail was eventually converted into the bike trail connecting Crossen and Gera to the south. The bridge still remains in great condition despite its age and is a great place to stop for a picnic or even good photo opportunity, as seen with this photo. Spanning the White Elster on the road going to Haynsburg Castle to the east, this bridge features five arch spans totalling approximately 200 meters, the longest center arch span is around 50 meters. That span is flanked with two door-like openings on each corner, embedded into the piers, resembling an embedded pavillion on each corner. It is unknown what the original atructure looked like before World War II, but the date of construction goes back to 1911, according to local records. The bridge is one of three works of art one should see while in Haynsburg. The castle is three kilometers up the hill from the bridge. A train station along the rail line between Leipzig and Gera has a decorative lounge, even though trains no longer stop there. Haynsburg itself was a target of a witch hunt, for in 1624, one of the residents was burned at the stake for witchcraft. Since 2010, Haynsburg is part of a local conglomerate that includes two other villages. The town is only a handful that has witnessed steady population growth for it has 580 inhabitants. The bridge itself will be rehabilitated come 2018 with the purpse of improving its load capacity and its aesthetic value. Spanning the White Elster River, this pedestrian bridge connects the train station with the park complex along the river next to the city center in Zeitz. While travelling along the river along the Elster Bike Trail, this bridge is one of the two most visible structures near the vicinity of the train station. The bridge has a bedstead Pratt pony truss with welded connections. Judging by its aesthetic appearance, the structure appears to be at least 10 years old but no older than 20. It is unknown whether a previous structure had occurred there but because of the prescence of the pavillion across the river from the station, it may be possible that a structure had existed beforehand, but was either destroyed during World War II and was not rebuilt before 1990 or it fell into disarray during the socialist regime and was consequentially removed. But more information is needed to determine whether a previous structure existed prior to this one. Located over the Mühlgraben Creek at the confluence with the White Elster, this bridge is located right next to the aforementioned Moritzburg Pavillion Bridge. The bridge serves the Elster Bike Trail but it is unknown when the bridge was built. It would be unusual to have a bridge exist alongside the pavillion bridge for a long period of time, so one must assume the bridge was built after World War II, especially because of the ballustrades that were remodelled. 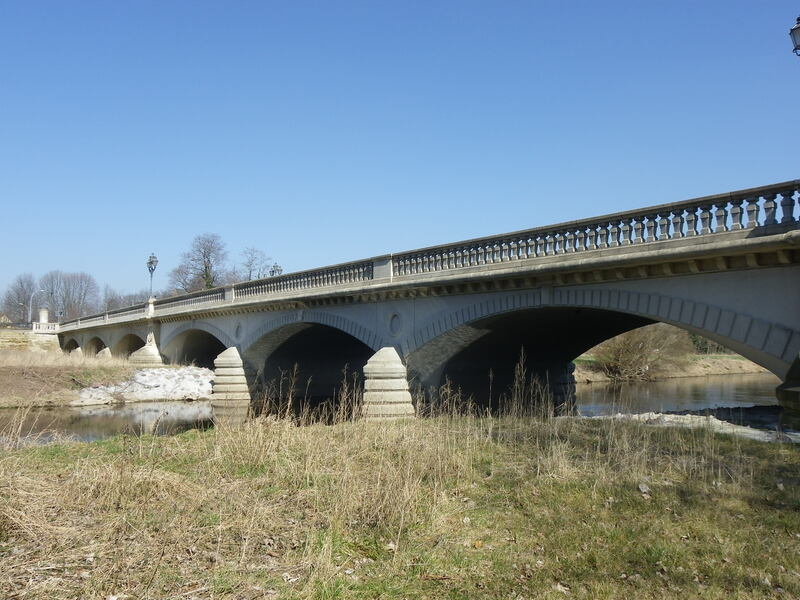 Yet more information is needed to determine whether the bridge was built in modern times to replace the pavillion bridge or if it was built at about the same time, especially as arch bridges were very common up until 1915. The author’s prediction is that the bridge was built to mimick the pavillion bridge in the 1950s or 60s to accomodate a trail running alongside the river. 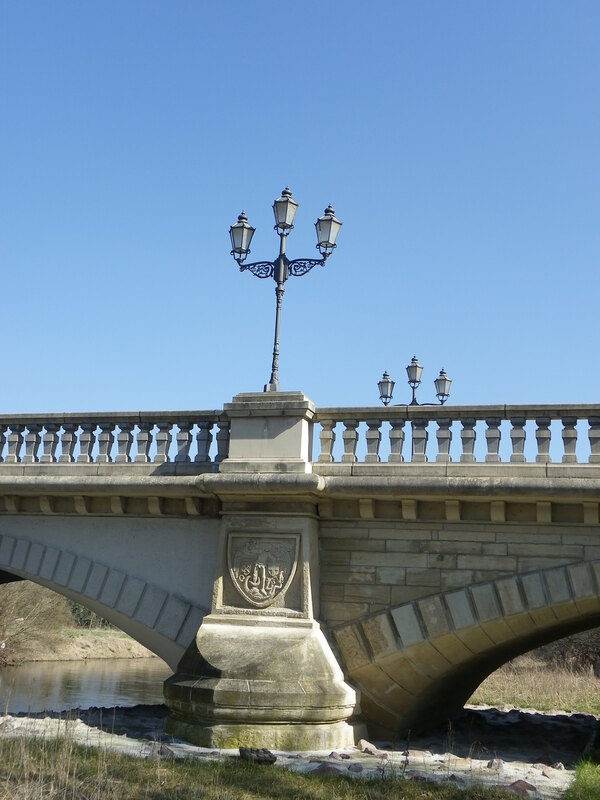 In either case, both bridges retain a high degree of historic and aesthetical value that it is worth stopping to photograph. 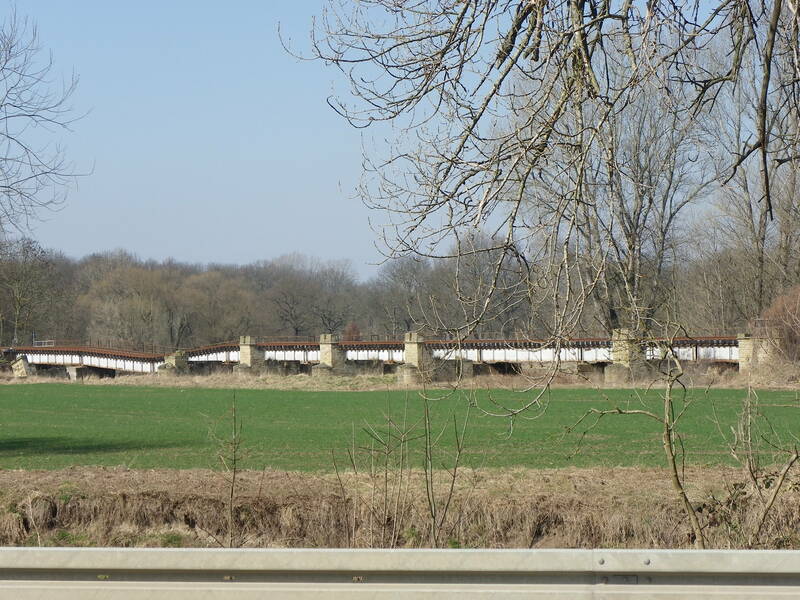 This is perhaps the most ornamental of the bridges along the White Elster River between Gera and Leipzig, for the 250 meter long seven-span concrete arch bridge provides the best access from the train station to Moritzburg Castle by car. The bridge has stone keystones and seal engravings above the piers. 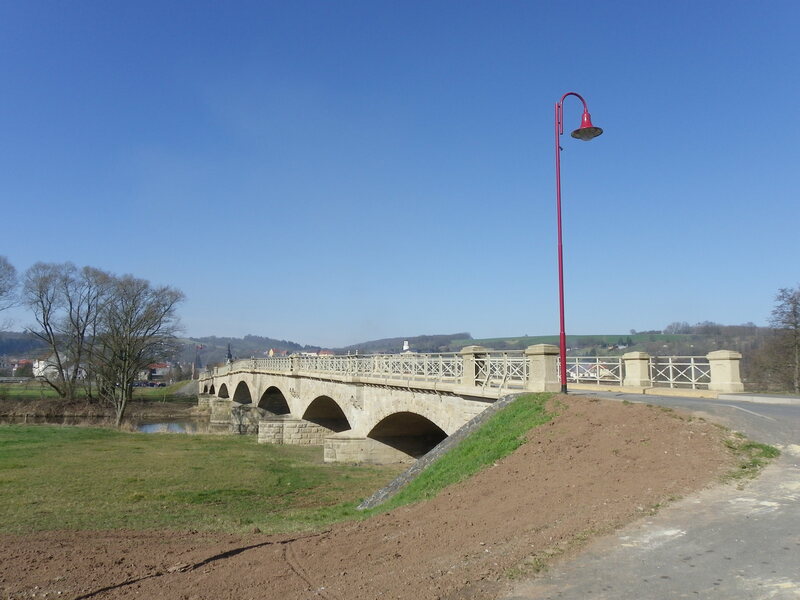 Its ballustrades are similar to the Untere Promenade Bridge and were redone most recently (10-15 years ago). Finials can be found on both ends of the bridge, but more unique and unusual is the lighting on the bridge- only one pair of lanterns are located at the very center of the span, but built on cast iron poles with a unique ornamental design. 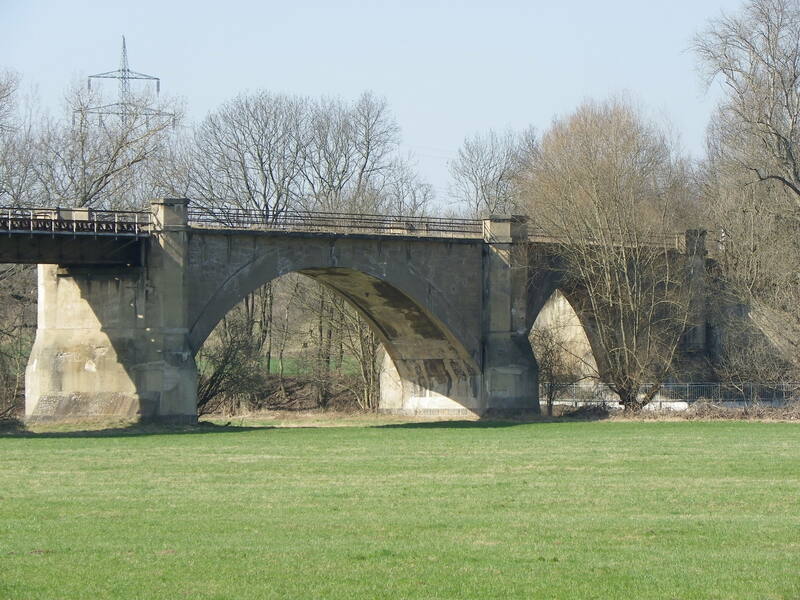 Judging by the age of the bridge, it appears to have been built between 1890 and 1915, yet when looking more closely at the structure ‘s center span in comparison with the outer ones, the bridge appeared to have been rebuilt after the war, as the Nazis blew up the center span in an attempt to slow the advancement of Soviet troops. The bridge and street itself were named in honor of Sophie and Frank Scholl, siblings who led the White Rose movement, a group whose purpose was to create an uprising against the Hitler regime. They were arrested and executed in 1944, along with dozens of other members of the movement. Yet the Nazi government ceased to exist with Germany’s surrender on 7 May, 1945. Hitler committed suicide a week prior to the fall. Spanning the White Elster east of town, the Tiergarten Pedestrian Bridge is one of the most unique of spans, as the bridge features two Howe spans meeting in the middle. The center of each Howe span is supported by one steel pier but the outer ends are anchored by concrete piers. The truss itself has bedstead end posts and features welded connections. Lighting illuminates the bridge. The bridge appears to be one of the younger spans, being built in the 1990s, but it is located near a small park on the north end of the river. It also serves as the division point for two sections of the trail. 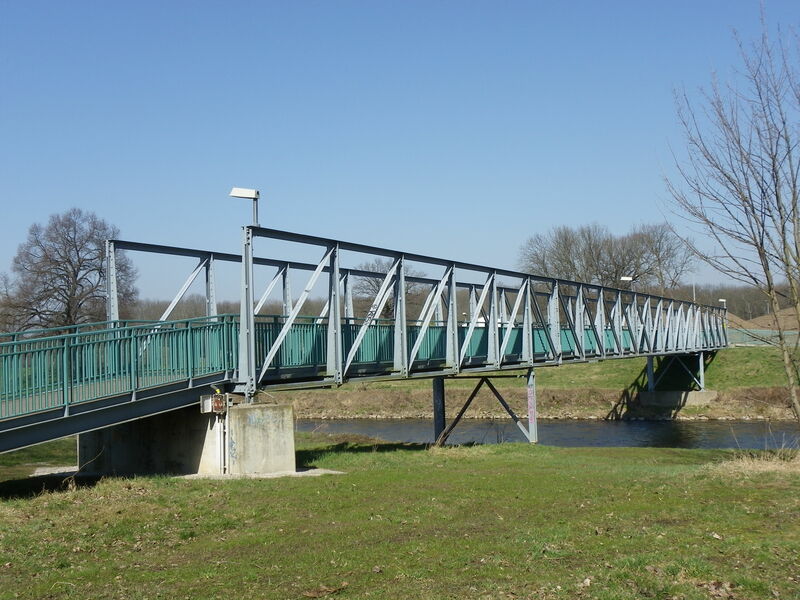 The older section of the Elster Bike Trail crosses this bridge before turning left and heading to Tröglitz. A newer portion of the trail does not cross the bridge but continues north past the park towards Massnitz and Zangenberg, tunneling through the forest along the way. Both paths have historic bridges along the way to photograph. 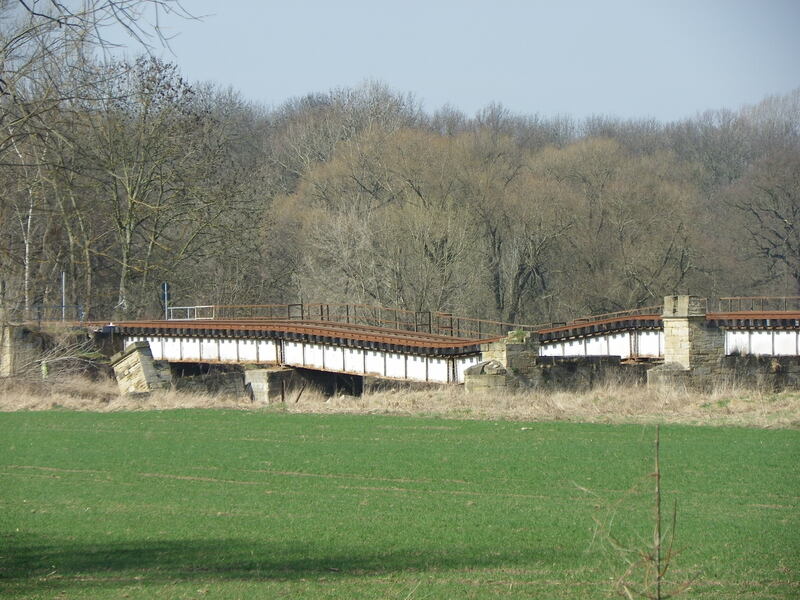 Located over the White Elster at the railroad crossing just outside the village of Tröglitz (1 km east of Zeitz), the Rehmsdorf Railroad Bridge features two different bridges. The river crossing, which one can see at the railroad crossing, consists of two Warren pony truss spans with vertical beams and riveted connections. Just 100 meters from that bridge is a deck plate girder bridge with eight spans, spanning a stream that empties into the White Elster. 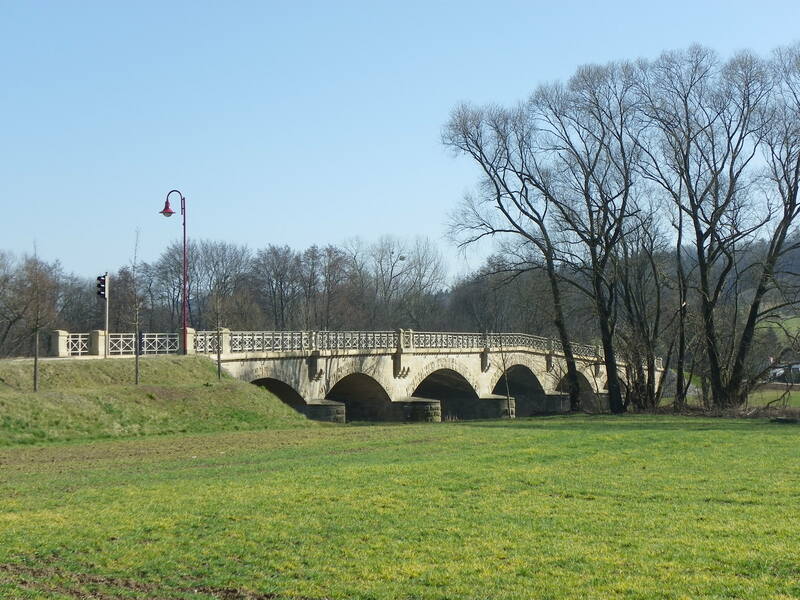 Both bridges, dating back to the 1920s, can be seen from the road connecting Tröglitz to the east and Zeitz to the west, and as the older stretch of the Elster Bike Trail runs parallel to the road, bikers and photographers have the best view of the two bridges with the camera. 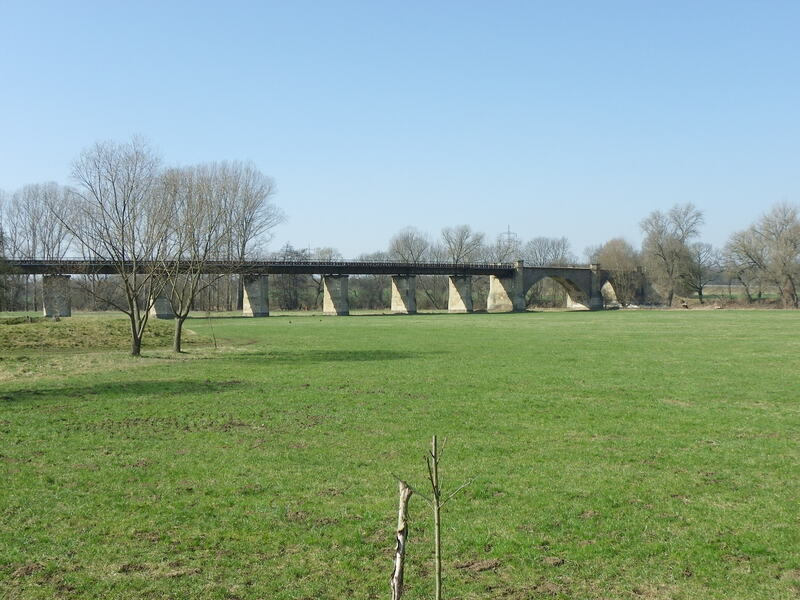 The bridges once served a rail line connecting Zeitz with Meuselwitz via Tröglitz and Rehmsdorf. Unfortunately, flooding caused the collapse of three of the plate girder spans resulting in the closure of the bridge and the rail line. Most likely the collapse happened during the most recent flooding in 2013. It is unknown whether that bridge will be replaced and the line reopened. But given the availability of bus service in the area, chances of anything happening with the line are slim. Close-up of the collapsed spans. Leaving the Zeitz area and heading north along the White Elster, we have this bridge, located only four kilometers from the one at Tröglitz. 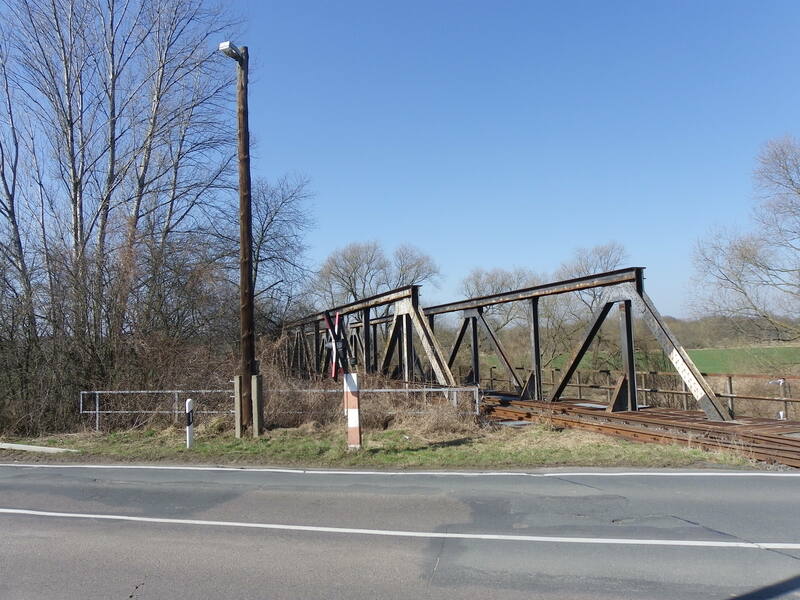 Even stranger is the fact that even though it is located near Massnitz and Börnitz, it also served the line that ran in a loop fashion going north from Zeitz, then looping onto this bridge before heading south to join the line that eventually terminates at Meuselwitz. 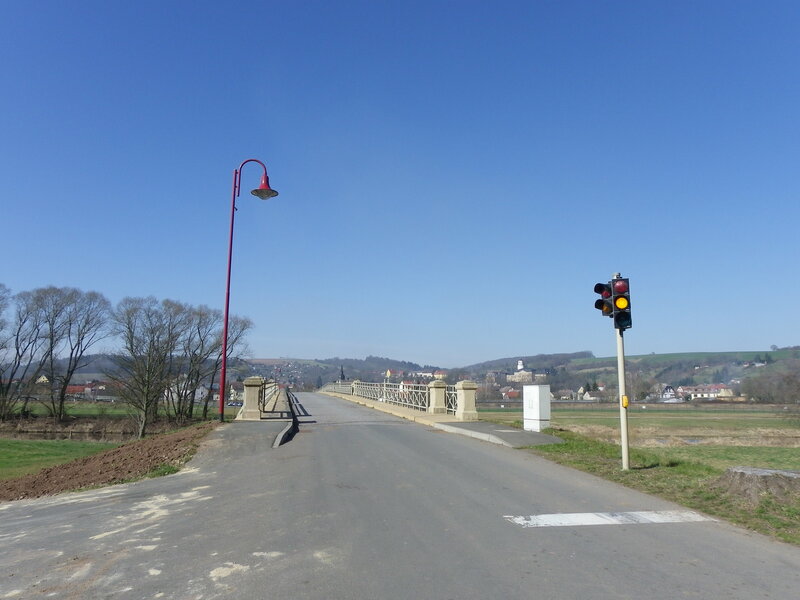 This leads to the question of whether this bridge was the original crossing serving the line between Zeitz and Meuselwitz before it was eventually realigned to go past Tröglitz and replaced by the aforementioned bridge. If that is the case, then when did the replacement take place? The author’s hunch: as this bridge features two concrete arch spans over the river, supported by 10 (approach) spans of steel deck plate girders (summing up the length to about 1 kilometer), and the piers of the approach spans look much newer than the arch spans (which most likely dates back to a time up to 1890), the structure was originally an arch span (probably 10-12 spans counting the two spans over the river). 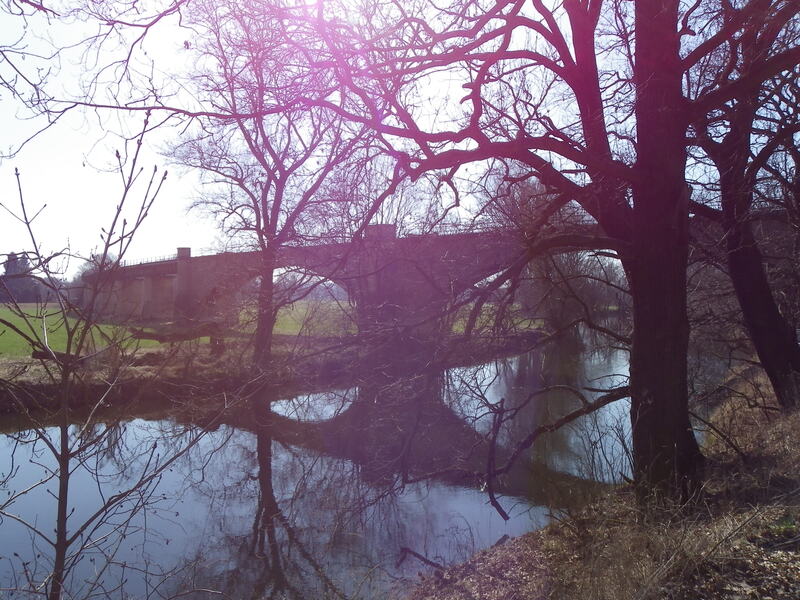 All but the two river spans were blown up (most likely by the Nazis in 1945), and while Soviet troops tried to rebuild this bridge, a temporary bridge at Tröglitz (the one mentioned earlier) was built, which later because its permanent replacement. While more evidence is needed to support this argument, Adolf Hitler’s plan of destroying everything in the path of the Allied troops, known as operation Nero, is known throughout the circle of German historians. Nero was enacted at the dismay of even his closest allies, shortly before his suicide in 1945, but failed when even the locals realized that the war was all lost and sabotaged the attempts of the Nazi soldiers to blow up the bridges. 80% of Germany’s remaining bridges were destroyed as part of the plan, only 10% of them could ever be restored. 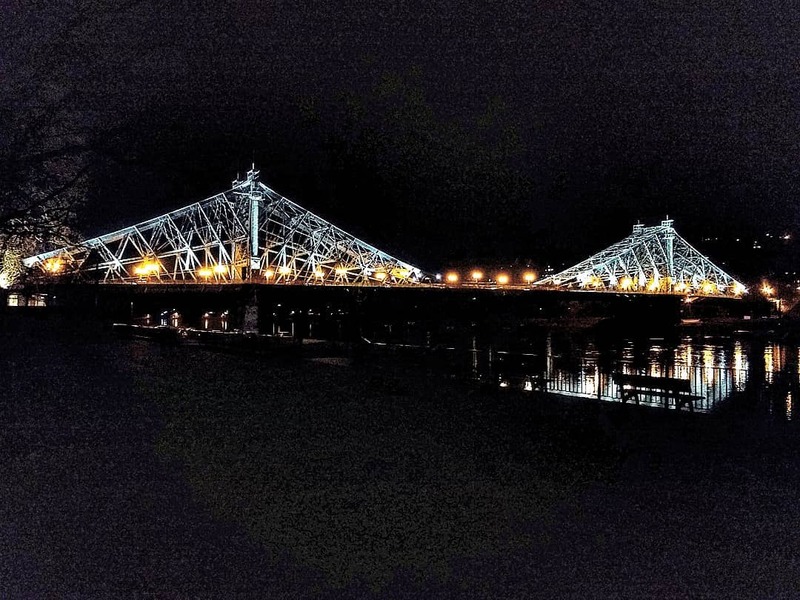 It is uncertain whether this bridge was one of the 80%, but it would not have been surprising if evidence points to that. 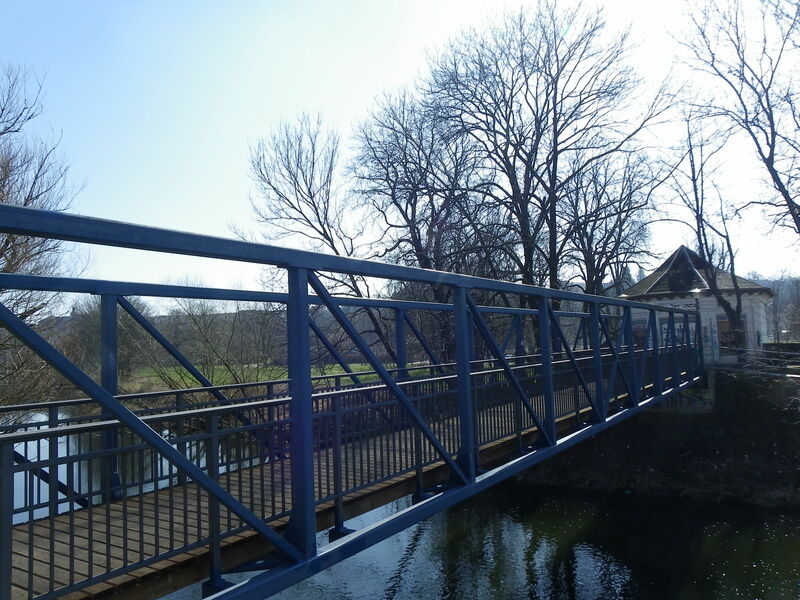 In either case, the bridge is accessible via street and bike route connecting Tröglitz and Massnitz on the east side of the river as well as the new Elster Trail between Börnitz and Zeitz. Close-up of the arch spans. How old do you think they are? 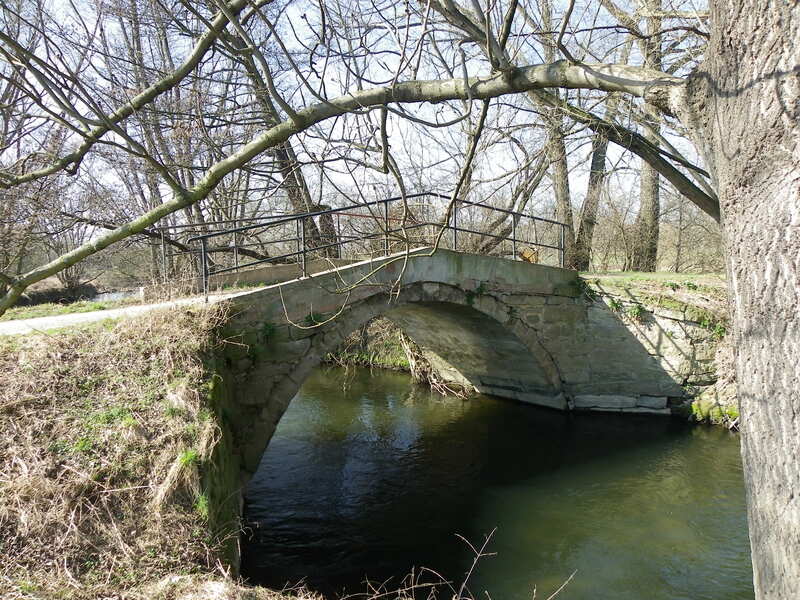 Located over Mühlgraben Creek just 500 meters from its confluence with the White Elster, this bridge appears to be one of the oldest remaining structures in the Zeitz region. The 25 meter long structure features a trapezoidal style concrete arch bridge, which is typical of bridges built in the 1800s. 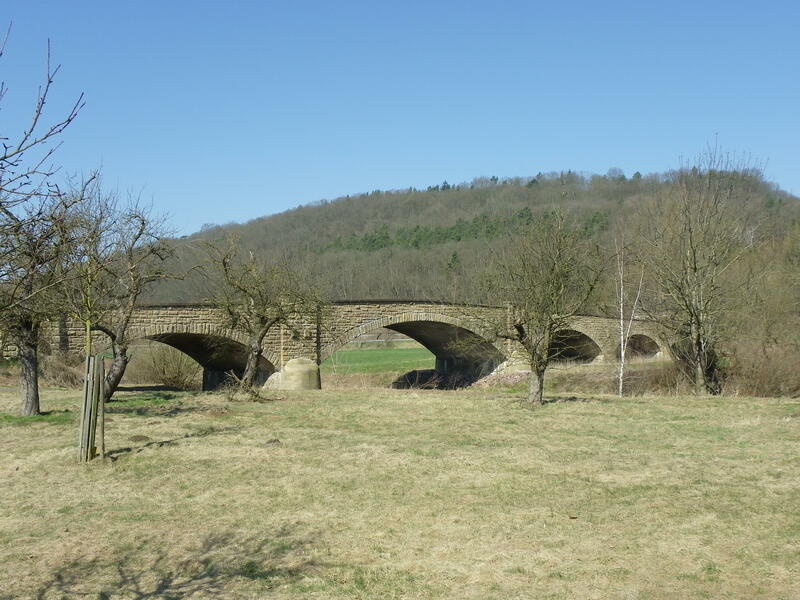 The bridge may have been built to serve horse and buggy traffic between Börnitz and Göbitz until newer highways diverted it away from this crossing. Although it still serves pedestrian, cyclar and farming traffic today, spalling cracks in the spandrels and the wingwalls show that some structural rehabilitation is needed in order for it to accomodate traffic in the future. Whether or not it will happen remains to be seen. The last bridge profiled on the tour is this crossing. 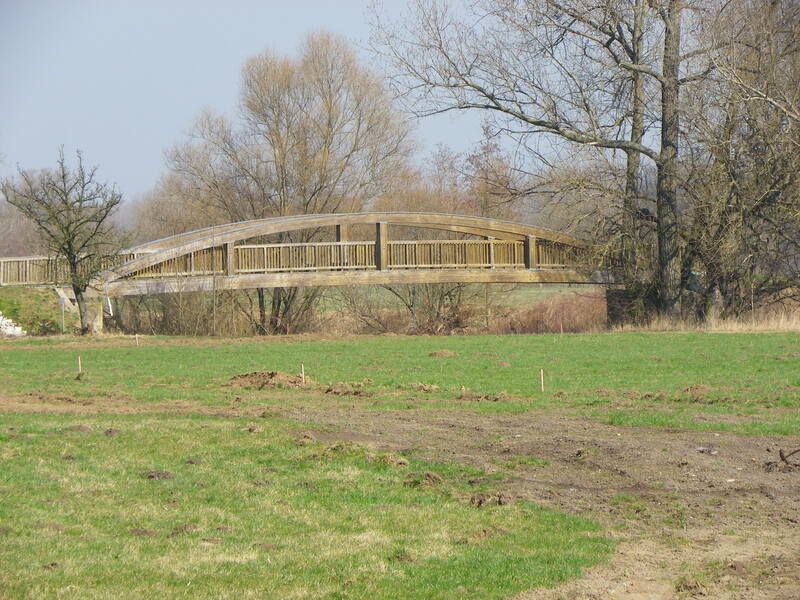 Spanning the White Elster River, this wooden pony arch span serves not only the Elster Bike Trail but also the trails connecting Börnitz and Göbnitz. The bridge was most likely built between 2008 and 2012 for it appears new to the eyes of the tourists. In either case, the bridge serves as a new addition to the village of Börnitz, which is a quiet community with just a handful of shops. To summarize this tour, the bridges in and around Zeitz, most of which are located along the White Elster, represent the charm and historic value that best fits the landscape of the area. These structures have a history of their own, many of which are worth researching, for the information on them are scarce. But as you bike along the Elster Bike Trail, you will find that these structures are worth biking for, even if the trail can be rugged at times. Yet these bridges are only a handful of the structures one should see in neighboring Leipzig (to the north) as well as Gera (to the south). Henceforth, never skip a stop for each one is full of surprises that are worth spending a few minutes of your time for. Zeitz is one of those forgotten examples that should not be forgotten.